There are so many reasons that I love Saint John Paul II. I really struggled to come under obedience to a Pope during my conversion process from being a Protestant. Then my husband took me to see "Witness to Hope" at an artsy Independent Film Theater in Rochester, New York. I came out of the movie and it was like a switch flipped instantly in my heart. I told my husband, "I don't know if I can follow all Popes. But I can pledge obedience to THAT Pope!" Saint John Paul II made obedience look easy to me. There are so many stories that I love about him. One of them happened during the last days of his life. Saint John Paul II was in the middle of a surgery and doctor warned his friend, "he may not be able to talk afterwards." The friend said seriously "Better let him die then!" I'm a fellow sanguine, and that story just makes me laugh. My husband would probably have the same thoughts for me. 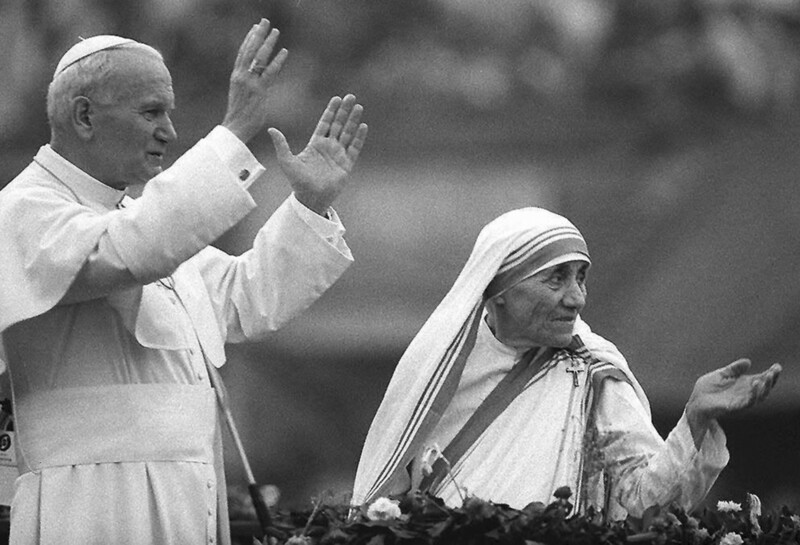 I love Saint John Paul II and Blessed Mother Teresa of Calcuatta. These are the people of the Catholic church that I loved, even before I became a Catholic.